Erin Broderick is an innovative teacher-librarian in Newton, Massachusetts. I invited Erin on Watch. Connect. Read. to chat about Mitali Perkin's visit to her school library. I wrote the words in green, and Erin wrote the words in black. Thank you, Erin! * Mitali Perkins visited my school library to talk with 4th graders about writing (and reading!) between cultures. 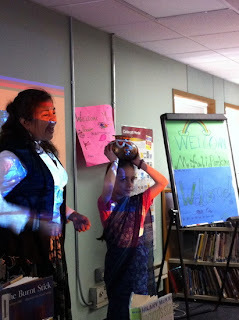 Mitali visits with the 4th graders every year and we always eagerly anticipate her presentation! *Mitali emphasized that we all need stories. Stories to find ourselves in and stories to lose ourselves in. She talked about her experience growing up with immigrant parents and trying to fit in among her peers in the United States. *I connect students with authors because of the correlations students make to their own writing and experience. I had several students really make strong connections to the stories Mitali was sharing about feeling different from the majority of her classmates. *Bamboo People is now the most sought out book among 4th graders. It is also a wonderful story about an unexpected friendship that develops among the political unrest and conflict in Burma. 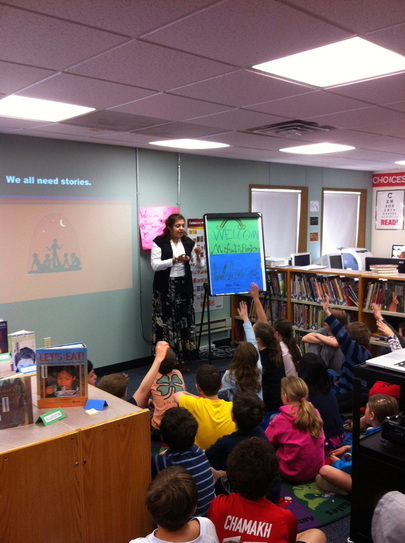 *I am certain my students walked away from Mitali’s visit rethinking the power of stories. She shared some books that were important to her during her childhood, and I heard children murmuring about their own keystone books, ones they reread and reread. The stories she shared about her family and career also sparked discussion and curiosity among the students. *I always recommend Mitali’s books to readers who appreciate new perspectives and insight to life in other cultures (and some who may not know it yet!). Since she is a local author, students are always eager to read a book written by someone who lives in their town! *Mr. Schu, you should have asked me about our new school library blog! 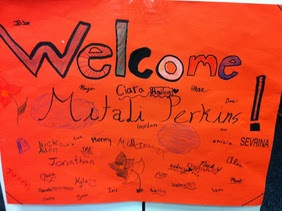 The comments were fast and furious after Mitali's visit, including 5th graders remembering her fondly, and awed students when Mitali herself commented back. Borrow Mitali Perkin's books from your school or public library. Whenever possible, please support independent bookshops.